The Genie® Z™-33/18 boom lift combines the benefits of a genuine electric indoor machine with the versatility and durability to perform outdoor routine maintenance tasks. 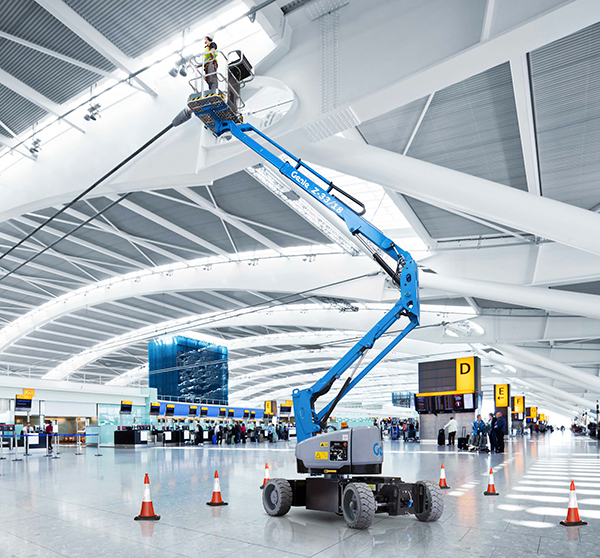 With a tight turning radius and Fast Mast™ boom function, the Z™-33/18 boom lift is well-suited to tasks where space is restricted such as airports, shopping centres and theatres. Its key features also include the choice of non-marking solid rubber or multi-surface tyres, long working cycles due to low consumption AC drive transmission, great ground clearance and the ability to drive at maximum height. Particularly well-suited to applications on sensitive surfaces inside airports, shopping centres and theatres - in addition to routine outdoor maintenance tasks, the new Z™-33/18 lift includes features to help increase efficiency on jobsites where space is tight. 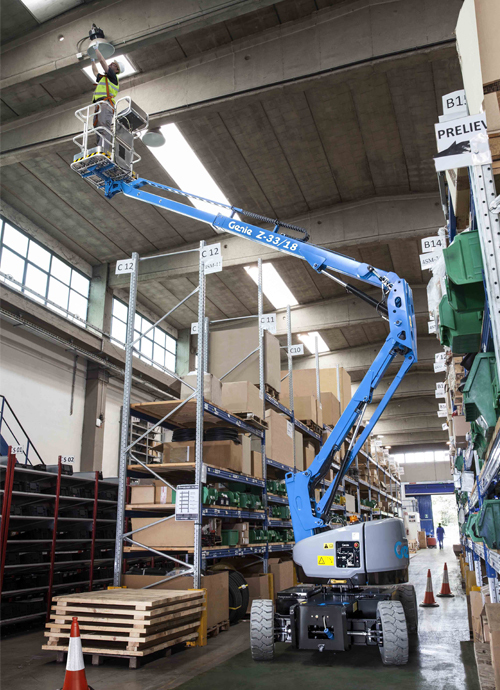 Its key features include a tight inside turning radius with zero tailswing for excellent manoeuvrability, the ability to drive at maximum height, plus the benefits of the Genie® FastMast™ boom system that shortens ground-to-top lifting time. The Genie® FastMast™ System enables the boom to be moved from full height to below grade, and from below grade to full height with the secondary boom fully raised. Easy to manoeuvre precisely where you need it for indoor jobs and in congested areas. Excellent balance of height, reach and weight permits the operator to work where low ground floor pressure is mandatory and to go up and beyond an obstacle as high as 12 m. Solid non marking or multi surface tyres will help the operator to complete tasks indoors as well as out. 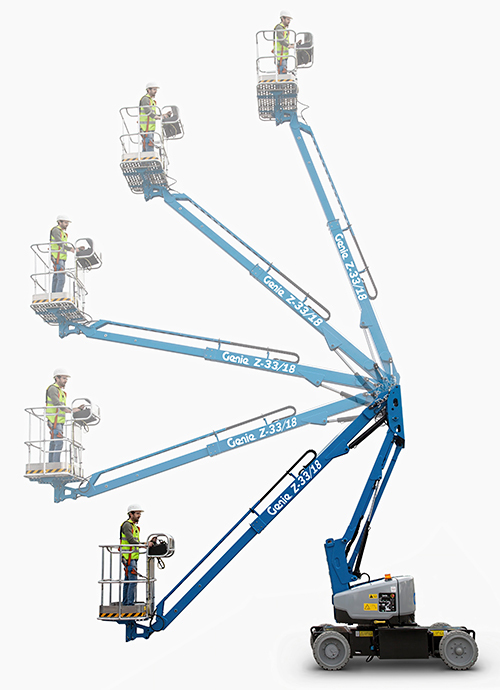 Featuring a compact 1.9 m (6.3 ft) wheelbase providing a gradeability of 30 percent, the Genie Z-33/18 articulating boom lift offers a working height of 12 m (39.4 ft), a horizontal reach of 5.57 m (18.3 ft) and an up-and-over clearance of 4.28 m (14 ft). In addition to a 76 cm (2.6 ft) long x 1.16 m (3.1 ft) wide platform, the aluminum man-basket supports weights of up to 200 kg (440 lbs). 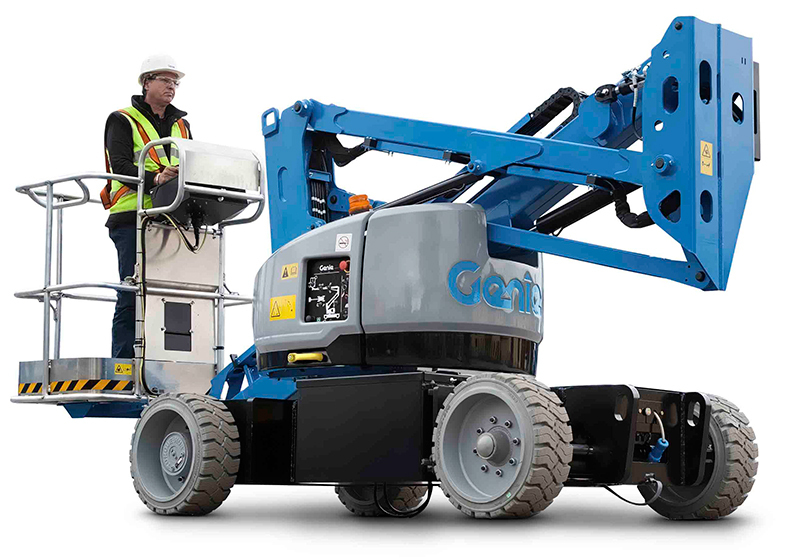 In addition to easily accessible machine components, the new Genie Z-33/18 boom lift features proximity switches conveniently protected within the boom to avoid damage. Thanks to common controllers used across the entire Genie boom lift family, technicians can apply their existing knowledge of Genie equipment to help make troubleshooting and maintenance faster and easier. Distinguishing the next generation of Genie products from previous models, the new Z™-33/18 boom lift includes the new Genie product design to combine a fresh new look and feel with improved ergonomic design features.